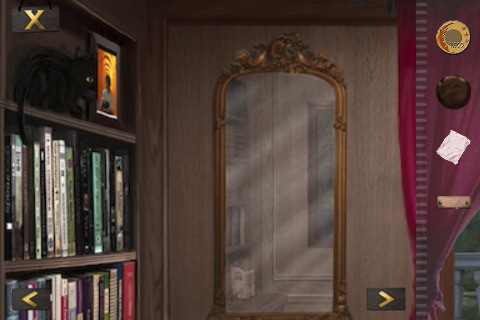 I’m an avowed devotee of room escape games and have spent hours upon hours playing them. I’ll even play them in languages I don’t understand sometimes, so it’s no surprise that I was drawn to Antrim Escape Full, despite the rather nonsensical name. The game’s thin back story introduces you to a pair of siblings investigating the strange tale of their grandmother, which, at some point, becomes a time-traveling mystery where you are, surprise surprise, locked in a room with no obvious way out. 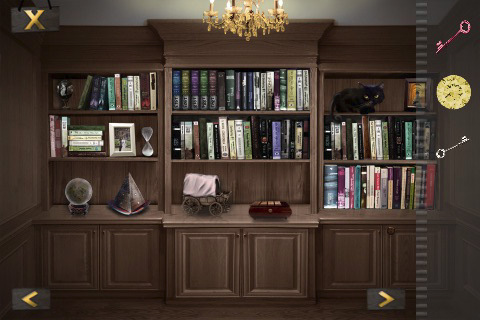 Happily, there are also numerous convoluted puzzles throughout the room to help you win your freedom. The puzzles themselves aren’t bad, but they don’t always make a lot of sense. There was far too much pixel hunting for my taste, which was complicated by the tiny iPhone screen I was working with. For the most part, the controls were single-touch based and perfectly straightforward, but every once in awhile, the game would require two finger tapping or shaking without any clear indication of what to do. One puzzle I only managed to stumble upon after playing at an awkward angle while lying in bed, so I found the overall puzzling experience rather rocky. The art direction of the game is also a little uneven, with anime-style opening scenes and photo-realistic graphics in the actual game. Once you get into the game, it’s really quite pretty, with a very spare and elegant Myst-like feel, but the overall lack of mobility and spotty puzzles made the game feel a little thin on content. Just about the entire game takes place in a single room, so there’s not a lot to explore, but it’s clear a lot of care and attention went into that one room as just about every nook and cranny is hiding a puzzle. Navigating between screens is also fairly smooth and they’re generally nice and bright, which is important, given the amount of pixel-hunting that takes place. This wasn’t my favorite room escape game ever, but room escape games are an underrepresented genre on the whole in the App Store. Despite the minor issues throughout Antrim Escape, this is definitely one of the nicer room escape games available, and I hope the developers will be releasing further chapters in the future. AppSafari review of Antrim Escape Full was written by Tracy Yonemoto on September 30th, 2010 and categorized under Adventure, App Store, Games, iPad apps, Puzzler. Page viewed 3826 times, 2 so far today. Need help on using these apps? Please read the Help Page.